FILE - Indian laborers work in the cotton processing and packaging industry in Kadi, near Ahmedabad. The U.S. aims to deepen business partnerships with India, including in its high-tech sector. U.S. Secretary of State John Kerry is expected to meet with Iran’s foreign minister about the Islamic Republic’s nuclear program and to encourage expanded American-Indian business ties during travels to South Asia and Europe. 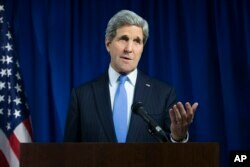 FILE - U.S. Secretary of State John Kerry will attend the Vibrant Gujarat Global Investors Summit in Ahmedabad, India. Kerry first made a brief stop Saturday in Munich, Germany, to meet with Oman’s ailing Sultan Qaboos bin Said. The 74-year-old has been getting medical treatment in Germany, according to The Associated Press. U.S. officials said the wide-ranging conversation touched on the ongoing nuclear negotiations with Iran — Oman has played a key role as intermediary in those talks — as well as concerns about the threat of violent extremism following the attacks in Paris this past week. Officials said Kerry also expressed his gratitude for America's friendship with the Sultan. Following the discussions, Kerry left for India in what will be his second visit in six months. Kerry will attend the Vibrant Gujarat Investment Summit, hosted by Indian Prime Minister Narendra Modi. The three-day conference will be in Ahmedabad, the largest city in India’s western state of Gujarat. State Department spokeswoman Jen Psaki said Kerry on Monday will hold separate meetings with Indian and American business executives attending the summit. “They will be talking about the ongoing opportunities … for the United States to continue to invest in India and to increase that partnership,” Psaki said, noting Kerry will visit a Ford Motor Co. plant expected to open soon. Trade between the world’s two largest democracies has topped $90 billion, according to the office of the U.S. Trade Representative. U.S. businesses are eager to take advantage of India’s high-powered industries, said Michael Kugelman, an analyst at the Woodrow Wilson Center in Washington, D.C.
“The services industry has for a long time been a real bright spot in India. It has really taken off tremendously,” Kugelman said, citing information technology firms such as Infosys are known worldwide. On the sidelines of the India summit, Kerry will meet with Tshering Tobgay, Bhutan’s prime minister. It will be the first bilateral meeting between a U.S. secretary of state and a top Bhutanese official. U.S. Secretary of State John Kerry reacts to the blustery weather on his arrival in Munich January 10, 2015. Kerry plans to travel Wednesday to Geneva, where he and Iranian Foreign Minister Mohammad Javad Zarif are expected to discuss Iran’s nuclear program ahead of the next round of nuclear talks. Those are set to begin Thursday. Iran and the five permanent members of the U.N. Security Council, plus Germany, are trying to reach a final agreement by the end of June. After his meetings in Geneva, Kerry also is scheduled to visit Bulgaria for talks on security cooperation and bilateral trade.